Timothy Ministry: The Baptism of John: Past or Present? It is generally accepted among most North American churches today that the baptism of John is not the same baptism we have today (bear in mind it is also generally lukewarm throughout the entire western church in these days as well). I want to show in this article that this is an erroneous interpretation of Scripture and one that produces consequences detrimental to the Body of Christ. So here we have a promise of another baptism, a baptism of Holy Ghost fire. This promise is later fulfilled on the Day of Pentecost, when the Holy Spirit falls upon the disciples as they wait in Jerusalem. It is the promise of power from on high; the supernatural infilling of God in man, enabling them to be effective witnesses of Jesus Christ. This gift of the Holy Spirit, often called "The baptism of the Holy Spirit" is an available blessing from the Lord even today, and He has been filling His people with power since the days of the early Church. The Bible instructs us that the Holy Spirit is a gift to be received, that a person must ask to be filled with the blessing. But now the devil has said: "You already have the blessing! You don't need to ask for it." And so nobody asks for it! Therefore time takes it's toll... erosion and corrosion... and we find ourselves today a weak and timid church, with no power, no passion, no strength and no authority... and yet we firmly declare: "We are filled with the Holy Spirit!" The truth is, we are a sick church surviving only on cold bread and lukewarm water. Oh, the depths of our absurdity! Can anybody stand up and say our Church is ablaze like the church of the Apostles? But you say: "You are right, but times have changed." Do you think Jesus planned it this way, therefore our condition is satisfactory? No! I submit to you that our Lord Jesus Christ died for a Church alive and aflamed with the fire of God, more than conquerors and undeterred by the gates of hell! So where does the problem lie, that we cannot just retrace our steps and realign ourselves with God's Word? As in the beginning, Satan has twisted what God has said in order to fool the people, and he has done it again with John the Baptist. First of all, I give no credit to the devil, because his tactics in this case are feeble. The hindrance is man falling for his tricks. If we were to completely ignore the issue of the baptism of John, the doctrine of the Holy Spirit could still easily be understood (Acts 8:5-19), however, because so many people are stuck in the bog of baptismal errancy, we must address it. "And a certain Jew named Apollos, born at Alexandria, an eloquent man, and mighty in the Scriptures, came to Ephesus. This man was instructed in the way of the Lord; and being fervent in the spirit, he spake and taught diligently the things of Jesus, knowing only the baptism of John. And he began to speak boldly in the synagogue: whom when Aquila and Priscilla had heard, they took him unto them, and expounded unto him the way of God more perfectly. And when he was disposed to pass into Achaia, the brethren wrote, exhorting the disciples to receive him: who, when he was come, helped them much which had believed through grace: For he mightily convinced the Jews, and that publicly, showing by the Scriptures that Jesus was Christ." "And it came to pass, that, while Apollos was at Corinth, Paul having passed through the upper coasts came to Ephesus: and finding certain disciples, He said unto them, Have ye received the Holy Ghost since ye believed? And they said unto him, We have not so much as heard whether there be any Holy Ghost. And he said unto them, Unto what then were ye baptized? And they said, Unto John's baptism. Then said Paul, John verily baptized with the baptism of repentance, saying unto the people, that they should believe on him which should come after him, that is, on Christ Jesus. When they heard this, they were baptized in the name of the Lord Jesus. And when Paul had laid his hands upon them, the Holy Ghost came on them; and they spake with tongues, and prophesied. And all the men were about twelve." First, I will explain the general but false understanding of this passage, then I will present the true meaning. Right away, this distortion of Satan insinuates that Apollos was not saved. This they reason because the Scripture says "he knew only the baptism of John." But what is the baptism of John? In order to justify his false belief, Satan declares the baptism of John obsolete, meaning, it was a sacrament only used BEFORE the death and resurrection of Christ and not after. He then submits that a brand new sacrament of baptism is instituted: "baptism in the name of the Lord Jesus" (as said in Acts 19:5). Thus, Apollos knew only the baptism of John, and not the baptism in the name of the Lord Jesus, therefore he was not saved. Though this sounds good, it is dreadfully wrong. What this means is... if Apollos was NOT saved, then he only needed to be instructed in the way of salvation. But if Apollos WAS saved, then Aquila and Priscilla needed to teach him about the baptism of the Holy Spirit (just like I am teaching right now). The second passage of Scripture is a story of Paul meeting several disciples on the back road to Ephesus. Satan's distortion implies that the disciples were NOT saved (like Apollos was not) and that Paul needed to instruct them in the way of salvation, because the baptism of John was an obsolete sacrament (read the passages again for clarity). The point the devil is trying to make is that there is no need to be baptized in the Holy Spirit, because he has fooled the church into thinking the Spirit is already within us from the moment of salvation. Therefore, he must succeed in misleading us to think that these two stories are not speaking of the baptism of fire, but are simple conversion stories... when truly, the inspired text is trying to tell us that there is a second blessing! These two stories are all about the baptism of the Spirit! Only the fifth point directly indicated his affiliation with Christ, however, all four other points suggest this man was saved with a solid understanding of prophetic truth. Yet Aquila and Priscilla had to "expound unto him the way of God more perfectly." What was his error? Not his eloquency... not his might in the Scriptures... not his instruction in the way of the Lord... not his fervency of spirit... not his diligence in preaching about Jesus... The Bible clearly tells us his problem: "but he knew only the baptism of John." This, and this only, was his problem. So then, as I said earlier, here lies the question. Is John's baptism the same as ours (which means Apollos WAS saved but wasn't filled with the Spirit) or is John's baptism obsolete (which means Apollos was NOT saved and needed salvation)? Baptism by water is the baptism of repentance; and what is repentance? A pledge of a good conscience towards God. This is exactly what John the Baptist was preaching in the wilderness! Repent! A person baptized by John did not have to be baptized for repentance all over again. 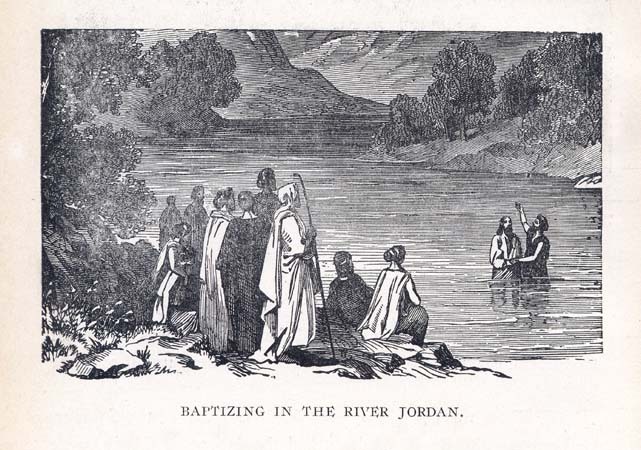 The only difference is that John did not know who the Messiah was, so he told people to believe in the one who was to come... we now know Jesus is the Christ, so when we baptize people in water, we baptize them "in the name of the Father, the Son and the Holy Ghost" as Jesus commanded, but let no man mislead you: the baptism of water is still the baptism of repentance, and this has not changed one bit. Water = repentance. Here we have Peter giving the same command. So when a person is baptized today in our churches, understand fully that they are experiencing the same baptism that John ministered, which is the sign of repentance towards God. Therefore, Apollos was saved, for all points indicate this, for he had undergone the baptism of repentance for the remission of his sins. Aquila and Priscilla took him aside to teach him about the baptism of fire, the filling of the Holy Ghost! Likewise in the second portion of Scripture, Paul asks: "Have ye received the Holy Ghost since ye believed?" Notice he doesn't ask, "when you believed." These men were disciples who already believed in the Lord Jesus Christ. They also knew only the baptism of repentance, but had not yet experienced the second blessing, the filling of the Holy Spirit. Thus, Paul goes on to say: "John baptized with the baptism of repentance" and then baptizes them in the name of the Lord Jesus Christ. Ah, but here the devil objects: "See? They had to be baptized in the name of the Lord Jesus!" Absolutely, but what exactly IS the baptism of Jesus? It is not the baptism of repentance... That was the baptism of John, and these men were saved. The baptism of Jesus is the baptism of fire! "I indeed baptize you with water unto repentance: but he that cometh after me is mightier than I, whose shoes I am not worthy to bear: he shall baptize you with the Holy Ghost, and with fire." (Matthew 3:11) And to prove this, what happens next? Do they jump into the water? No, Paul lays his hands upon them and they are filled with the Spirit. HAVE YE RECEIVED THE SPIRIT? A contemporary question to ask yourself, like Paul asked, is: "Have you received the Holy Spirit since you believed?" The power of the Spirit is not just a feeling you get inside you at conversion. He is the promise of Jesus Christ to make us witnesses unto the world for the truth. As said before, the Church of west is in terrible shape because of the lack of power, because of the lie that we are automatically full of the Spirit at conversion. We will never see our nation impacted with the gospel until we admit to our fruitlessness, our fleshy attempts to do God's work, and our complete lack of the anointing of the Spirit. So the question remains: Have you been baptized in Holy Ghost fire? Well done, Eli. This is a very controversial subject in the Body of Christ and you've demonstrated your point lucidly. Man, if I didn't believe that Holy Ghost baptism was the second blessing, this teaching would surely cause me to examine the scriptures more carefully. God has really given you a wonderful talent of conveying truth in a systematic, convincing style. The future lambs that will entrusted into your care will be well fed, I'm sure. How is a person enabled to repent if the Holy Spirit is not imparted until some point after belief? The Holy Spirit convicts the world of sin, righteousness and judgment (John 16:8). But the baptism of fire is the enduement of power upon the believer to be a witness to the truth he/she now knows. Would you say that baptism of fire is essential for salvation? Or would you say that it is just the 'icing on the cake' and that baptism of repentance is 'good enough' for a relationship with God? The Bible makes it clear that one is saved by faith in Jesus Christ alone, through repentance and forgiveness of sins. You don't have to be filled with the Spirit to be saved, as some very erroneous churches teach. The baptism of the Spirit is power for ministry. A perfect example of this is when the apostles were choosing seven men to distribute food among the people, and they chose seven men full of the Holy Spirit (Acts 6:1-7). They also laid their hands on them to be filled... Stephen, the first martyr, was one of them! God bless you... any more questions, feel free to ask. This is a very interesting post. I must say that I have never thought about this before. Thank you for sharing your thoughts. You characterize your topic as "a disappearing doctrine." You say that "most North American churches today" have an "erroneous interpretation of Scripture" on this matter. My question for you is this: Which is more likely, that most North American churches today are wrong on the issue, or that you, uneducated in theology and hermeneutics, are wrong? You say that several great Christian leaders of the past have believed what you are saying. I would be very interested to hear/read something about this, if indeed it is true.